All roads led to the Oriental Hotel, Lagos for the Nigeria Internet Registration Association (NiRA) gala and web awards night specially organised to celebrate NIRA 10th Year Annivesary and as well as to recognise all those using the .ng domain names and other lovers of .ng. The event had two sets of awards; the first was the .ng web awards while the other was the Presidential awards. The .ng web awards recognised companies and institutions that have effectively used the .ng domain over the years and have indirectly helped to promote the Nigerian brand online. NiRA's ultimate goal is to get more Nigerians to use the .ng domains because Nigeria currently has less than 100,000 .ng domains while South Africa has over 1 million .co.za domains. Like the Chairman, Board of Trustees, NiRA rightly pointed out, it is a shame for any Government establishment in Nigeria to still be using any extension other than .ng. 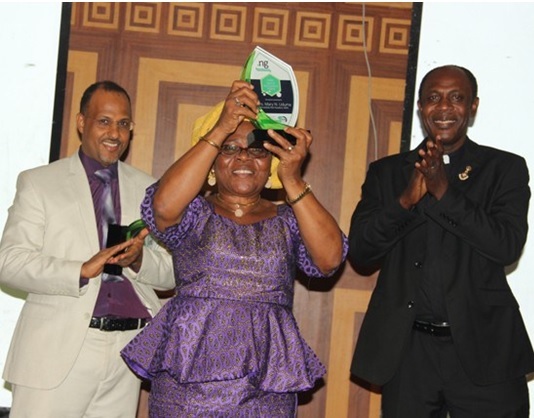 Winners of the .ng competitions preceding the gala and awards night also received gifts from NiRA. This is encouraging as many Nigerian government establishments, business concerns and individuals as possible to embrace the .ng domain name going forward. The Minister of Communications was duly represented at the awards ceremony. Explicit Dancers were on ground to add flavours to the well attended ceremony.